Reinvention is the key to success in these volatile times--and Pamela Mitchell holds the key to reinvention! In The 10 Laws of Career Reinvention, America's Reinvention Coach® Pamela Mitchell offers every tool readers need to navigate the full arc of career change. Part I introduces the Reinvention Mindset, with what you need to know to be prepared mentally to get started. 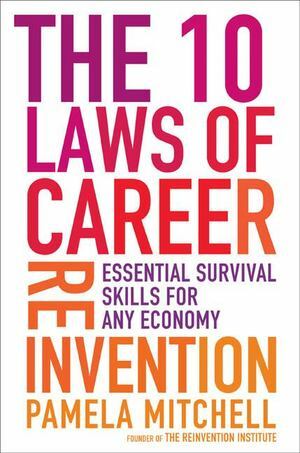 In Part II, you read the real-life stories of ten individuals who successfully made the leap to new and unexpected careers, using the 10 laws: The 1st Law: It Starts With a Vision for Your Life The 2nd Law: Your Body Is Your Best Guide The 3rd Law: Progress Begins When You Stop Making Excuses The 4th Law: What You Seek is on the Road Less Traveled The 5th Law: You've Got the Tools in Your Toolbox The 6th Law: Your Reinvention Board is Your Lifeline The 7th Law: Only a Native Can Give You the Inside Scoop The 8th Law: They Won't "Get" You Until You Speak Their Language The 9th Law: It Takes the Time That it Takes The 10th Law: The World Buys Into an Aura of Success Each story is followed by an in-depth lesson that explains how to adapt these laws to your own career goals, and what actions and precautions to take. The lessons answer all your tactical concerns about navigating the roadblocks, getting traction and managing your fears. The final section provides workbook exercises for fine-tuning your reinvention strategies for maximum results. Clear-headed, calming, practical, and thorough, this is the ideal action plan for getting through any career crisis and ending up securely in the lifestyle you've always dreamed of having.